At some point, someone pointed out that this is technically Anniversary X, and it was a pretty slippery slope from there. Scott doesn’t actually work out that Madelyne and Jean are identical until X-Factor #14. Headcanon: Hella prosopagnosia. Scott and Jean are reunited in a panel that appears to have fled from Apartment 3-G to X-Factor #1. Charles Xavier of X-Men vol. 2 #30 is the best Charles Xavier. Print of the week! 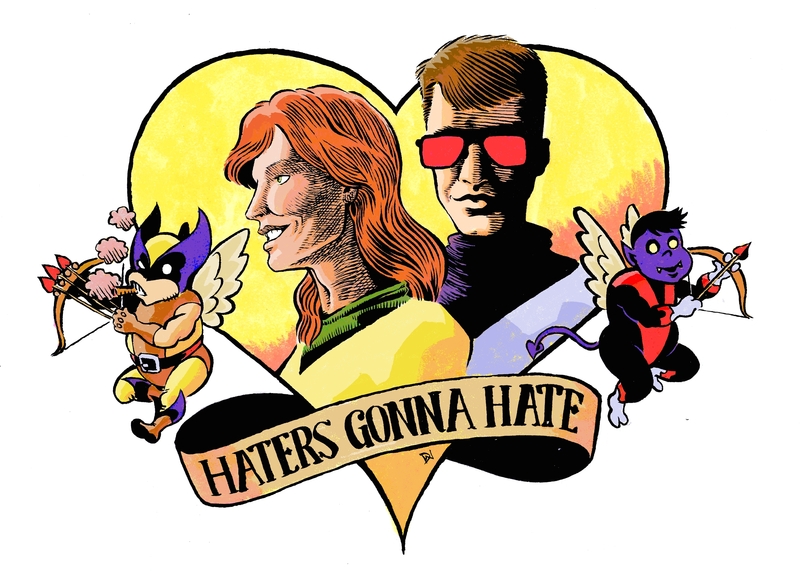 You can find prints of David Wynne’s “Haters Gonna Hate” Scott & Jean illustration over at our shop until September 14–or drop David a line to buy the original! NEXT WEEK: Rachel and Miles are going on vacation. Read a book. WEEK AFTER NEXT: The New Mutants!